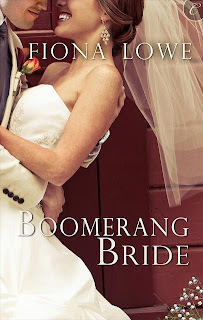 ROMANCE BOOK PARADISE: Fiona Lowe and her RITA nominated BOOMERANG BRIDE! Fiona Lowe and her RITA nominated BOOMERANG BRIDE! Amid all the upheaval she is facing, I managed to get Australian author Fiona Lowe to give us a few minutes of her time! So here she is, sharing with us about how she felt when she found out her first single title book, BOOMERANG BRIDE got nominated for the prestigious RITA® awards by the Romance Writers of America®. Thanks so much, Nas for having me here today at Romance Paradise. It’s always a pleasure! I’ve had a huge week! Last Tuesday morning I woke up to hear my iPad going ‘ping, ping,’ and I assumed it was my calendar reminding me of appointments, only I couldn’t think of anything special that I had to do apart from start a new book. As my feet hit the floor, the pinging went into overdrive and I realized they were Tweets coming in and again, I was confused because the day before I had only tweeted once or twice and I couldn’t imagine such a response. I found my glasses, got to the kitchen, switched on the light and saw, ‘Hey @FionaLowe Congrats on your #RITA12 nom for Boomerang Bride. ‘Just like some of my heroines, my mouth dried and my heart leapt in my chest! I couldn’t believe it. I instantly checked the answering machine for a message from RWA in Texas because I had been told by past nominees that a phone call was how they found out they were finalists, but there was no blue light or any missed calls. I tried to find the RWA list on the internet but my fingers were all wobbly so I rang Angela James from Carina Press and asked her if it was true. She laughed and said, ‘Yes’. She also told me that Boomerang Bride was the first Carina Press book to be nominated for a Rita. Woot! Squee! This book, which took a long time to find a home keeps kicking goals. I was excited when it got print published in the US as I always thought it would only ever be an eBook and now it has garnered three nominations but there is still some bigger news coming about it soon but I just can’t say exactly what yet. It seems to be a tradition that when I get great publishing news my husband is out of the state! When I sold my first Harlequin Medical Romance he was in Canberra. This time he was in Sydney so I called him and then I spent a wonderful Tuesday floating and answering the wonderful emails, tweets and Facebook messages from the very generous writing and reading community. Then reality hit the next day and I got sick with the virus The Lad had brought home from school. Not happy! However, lying on the couch with the iPad meant I had time to check out flights to the US because my husband said, ‘You must go.’ So I am! How we are going to sort out the boys for two weeks when their father isn’t home weekdays will be interesting and I will probably fall into the plane seat a wreck before I’ve started after having organized casseroles, enough school shirts and socks to last the distance, but I am coming to the conference. I’m so excited that I will be meeting in person writers and readers I’ve only ‘E’ met. And Nas! I’ll meet Nas, although I am hoping to meet her when I am in Fiji in late June. So if being nominated for a Rita wasn’t enough in a week I’ve also sold my 18th medical romance, a Christmas story out in November, my second ‘Bride Book’ to Carina Press which makes my 20th novel to Harlequin. Oh and I have a new release. Sydney Harbour Hospital: Tom’s Redemption. This is a standalone book as well as being the fourth book in the Sydney Harbour Hospital series and it took me a long way from my ‘small towns with big hearts’ and back to a big hospital in a vibrant and cosmopolitan city. It was a lot of fun to write and Melanie Milburne’s husband was a great help with the technical details of surgery. I also loved the trips to Sydney for research! I have visited many places because I have read about them in books. I finally got to Prince Edward Island when I was 30 after reading the ‘Anne of Green Gables’ as a child. To celebrate my wonderful week, I’m giving away a copy of Sydney Harbour Hospital: Tom’s Redemption to a lucky winner. Just tell me where have you visited because you read about the place in a book? 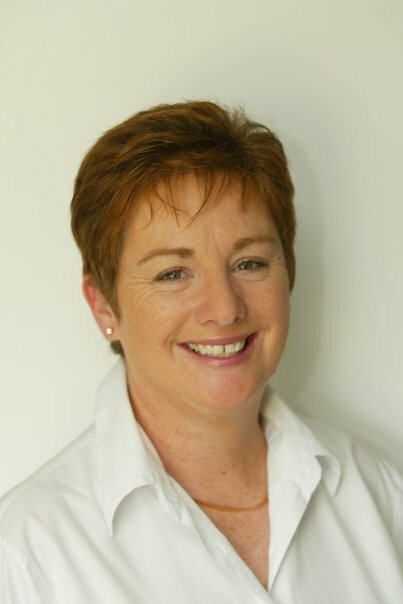 Fiona Lowe is an award-winning, multi-published author with Harlequin and Carina Press. Whether her books are set in outback Australia or in the mid-west of the USA, they feature small towns with big hearts, and warm, likeable characters that make you fall in love. When she's not writing stories, she's a weekend wife, mother of two 'ginger' teenage boys, guardian of 80 rose bushes and often found collapsed on the couch. A current RT Book Reviwers' Choice Award nominee, you can find her at her website, facebook, Twitter and Goodreads. Boomerang Bride is available now from Carina Press,Amazon Kindle, Nook and all other online book stores. Congratulations to Fiona on the RITA nomination! Sydney Harbor Hospital's most elusive—and eligible—doctor has returned…Two years ago, renowned head of neurosurgery Tom Jordan disappeared. Now he's back and his secret is out. Tom's blind and will never operate again. It's available now in the UK & the USA. For pictures and background information, head to Fiona's website. She has written a neurosurgeon who becomes blind in an accident and there is fantastic amount of background information on her website. 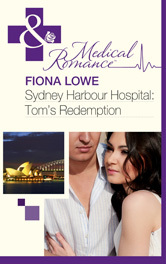 To celebrate Fiona is giving away a copy of Sydney Harbour Hospital: Tom’s Redemption to a lucky winner. Just tell her where have you visited because you read about the place in a book? and how jealous I am about you having been there when I am such an Anne of Green Gables fan too! I've been lucky to have travelled overseas quite a bit - it's one of my favourite things to do! Have a fab time in Anaheim and bring that pretty lady home! I went to the Cayman Islands (Grand Cayman Island to be exact) in 2009 and I have read a little bit about the islands and the rest of the Caribbean Islands. Thanks again!! Ah, you have been to the glorious Italian Riviera and Portofino. I read the GodFather when I was in Italy LOL! Thanks for calling by. I haven't been to the Caribbean but I love the music and the food and the islands are definitely on my list. Congratulations on your Rita nomination! So happy for you and I hope you're feeling better! Jeeze. Not sure where my comment went so I'm trying again. Hope it doesn't post twice. Congratulations on your Rita nomination, Fiona! So happy for you! And I hope you're feeling better. I don't think I've visited anywhere because of what I've read. We always visit family, no matter where they live. Sure, we get out and about when there (and when they visit here) and visit museums, etc., but the majority of our time is spent doing jigsaw puzzles, reading in the same room, painting, pulling weeds, cooking, grocery shopping, etc. Welcome to Romance Book Paradise! Congratulations on BOOMERANG BRIDE being nominated for the RITA! I loved reading how you found out about being nominated. Wishing you and Boomerang Bride heaps of luck! And Yay! For BOOMERANG BRIDE for breaking new ground for Carina Press! I'm with you! I want Fiona to bring that pretty lady home! Fiona can I carry it back?! Thanks for coming along to wish Fiona luck and sharing about your travels! Wow, Fiona. What a great adrenaline rush story. Congratulations. Love your title. yahoo, Fiona! I'm so excited for you about Boomerang Bride's success! Can't wait to see you with that RITA pin in August (not saying more in case I mozz you!)! Have a wonderful time in Anaheim and I'll be cheering for over here on this side of the Pacific! Nas, lovely to see you and I hope you're keeping your toes dry! Congratulations, Fiona! The RITA nomination and sale of your next two books is amazing. You have a whole lot going on. Good for you! I'm going to check out your titles right now. Thanks for the introduction, Nas! Laney, we are spending Easter visiting my cousins in the next state! I am sure there will be board games! Congratulations on your Rita nomination, Fiona! I'm so happy for you! Thanks, Sharon! I think the pin will be as close as I get but am looking forward to showing it to you although it might be awed by all your R*BY pins! Emily, Thank you so much for the congratulations. Congrats on your release it sounds like a tremendously fabulous read ! For me I have not yet gone where I wanted to because of reading about it in a book but there is one place that I have read about so many times in so many wonderful books , Italy it sounds like such a magical place and if I ever get the chance I so there ! Thank you for a lovely post Nas and thank you Fiona for visiting and thank you for the amazing giveaway! What exciting news to wake up to! Congratulations! Fiona, congratulations on being nominated for a Rita. Great premise (and title) for Boomerang Bride. Oh, yes, congratulations indeed. I would certainly visit a place because I visited it in a book. I also loves reading books about Dublin, my native place. I read novels set in Lucknow in India before I ever set foot here. Congratulations, Fiona! And nice to meet you. ... board games! How could I forget? We play card games occasionally with family (euchre, Canasta, Uno, etc. ), but usually there are board games involved too! Aren't they great for conversations without a television having to be on? Lots of fun abounds. Have a great time, Fiona! Thank you so much! YES, Italy is a place to put on your 'do do' list! Rachel, many thanks for your congratulations. Theresa, Many thanks for the congratulations and thanks for calling by. Jemi, when I was living in Wisconsin we made the trek to PEI. I was in heaven and my darling husband tramped around with me along with our then 2 year old who had a leg in plaster. I have pictures! Maybe I'll blog about that after Easter over at my blog. Thanks, Maria. Yes, India is on my 'to visit'list. I have read SO Many books set there. Yay for another Aussie author! What a way to find out about your nomination! And what a thrill! Congratulations on the RITA nomination! I still haven't visited PEI; I'd love to see Anne of Green Gables' house! I visited Scotland after reading about it! My initial comment got swallowed by a Blogger glitch. Woo hoo. Congrats on the nomination. Congratulations. That must have been one amazing rush to find out your writing had been acknowledged like that. Lovely friends! Thank you for coming along to talk with Fiona Lowe! She was one of the very first authors with whom I started emailing personally! She and her advice hold a very special place for me. Thank you Fiona for all your warmth and generosities over the years! Hi Fiona and waving to Nas. Congratulations on the nomination. So very happy and exciting for you. All your Medical Romances sound interesting. Wow, I take a day to drive 500km and come back to all of this. THANKYOU! Sorry, I am using my husbands phone to toggle Internet so can't answer everyone individually but pleas know how much I appreciate you all calling by and the congratulations. Congrats to Fiona - what a wonderful honor! Random.org picked up the name of Susan Fields as the winner! Congratulations Susan! Please contact Author Fiona Lowe via her website!